Reduction of UK poverty by reforming a. tax system, b. social security system, c. other. Why we worry about poverty? How can it come about? Marginal tax rates. Risk in society. Missing markets and free rider alturism. Why is it bad? Crime rates. People’s morality. Missing markets of insurance. Why not elliminated? Moral Hazard, incentives. Discuss more fully later. The most widely used measure of inequality is the "Gini coefficient" which ranges between 0 (everyone has the same living standard) and 1 (one person has all the money). 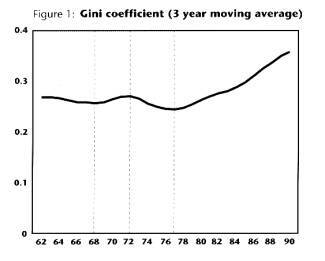 Figure 1 shows how the Gini coefficient has varied over the last three decades. 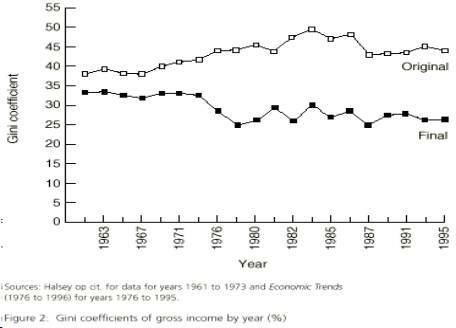 The vertical dotted lines indicate turning points in the trend in inequality. household living standards are measured by incomes after housing costs such as mortgage interest or rents have been paid. One reason for the growth in inequality in recent years has been a rise in home-ownership amongst lower income households (mainly via council house sales) coupled with very high interest rates particularly at the start of the 1980s and the start of the 1990s. Alternative finance: more progressive changes, alternative sources of finance other than tax system. Action to make work more rewarding than welfare must also take into account the existence of the 'poverty trap', which arises when people in work cannot improve their income by working longer hours or for higher pay, because working for more means they simultaneously pay more tax and receive less benefit. Reforms: incentives to get out themselves. Provide enough benefit so they wont be in poverty. Then moral hazard and incentives. make work pay, through a national minimum wage and a tax and benefit system that promotes work incentives. First, a new tax credit paid to families on low incomes, directly through the wage packet. In principle, a working family tax credit has a number of attractions. It could reinforce the effect of the minimum wage by making work pay. It could build on the success of Family Credit, increasing potential in work incomes and therefore the incentive to work. As a tax credit rather than a welfare benefit it should result in higher take up, while its clear link with the pay packet and the tax system should demonstrate the rewards of work over welfare. A working family tax credit could provide a highly effective way of targeting help at low income families: as well as improving work incentives, it could also help reduce poverty and strengthen the family. A critical test will be whether it can be delivered effectively and efficiently. Secondly, national insurance contributions, the current structure of which places a heavy burden on low paid workers and risks distorting the labour market. There is scope for bringing the national insurance structure more into line with income tax to ease administrative burdens on employers, to improve work incentives and to encourage the hiring of additional employees. However, the pace of reform must depend on the availability of resources. Thirdly, the 10p rate of income tax which the Government is committed to introducing as soon as it is prudent to do so. A lower starting rate of income tax would create a fairer tax system, reducing the tax burden on the low paid. Fourthly, the Government is determined that the working poor should benefit from the 10p rate and any future reductions in income tax. It is therefore considering what action is necessary on the tapers and other features of the benefit system to ensure that a lower starting rate of income tax benefits all the low paid. Poverty has been called one of the evils of the modern society. For some reason rational individuals are against it even when they have no risk of getting into poverty themselves (savings to provide subsistence can usually be accumulated with far less resources than have to be paid as national insurance contributions). Still, people care about other people’s poverty as well, and this makes the analysis somewhat more complicated. The reasons for caring about others is probably to do with culture and Freudian behaviour in childhood, it is very hard to deduce macroeconomic policies from these premises, however, one can evaluate different policies by predicting altruistic human action. This is what I will try to do in this essay: first look at the possible tax and social security system reforms that are justified economically, and then see whether they would actually work. So, what is poverty? There are two different measures: absolute and relative. Absolute is to do with starvation and subsistence, relative with social participation. In practice one normally uses a relative measure, say everyone whose income is below 40% of the mean national level is in poverty. This is measurement, although easy to interpret, is highly subjective as to where one draws the line. Furthermore, it shows no indication as to how deep in poverty the people actually are. Sen has produced a better index, one that uses a combination of income and Gini coefficient to measure the inequality. However, most empirical research is just concerned with the relative incomes of top and bottom decile, the approach I am going to adopt here. When the markets are working perfectly either no poverty occurs or its extent wouldn’t worry anyone. Its existence implies that there are distortions to Arrow-Debrew economy. I will briefly describe three: income taxes, free rider problems in altruism and missing risk insurance markets. First, only lump sum taxes guarantee a Pareto-optimal efficient outcome. With income taxes, people will not get the full benefits of their labour. The higher is the marginal tax rate, the less motivated people are to work. Now, with high amounts of benefits at the lower end of the income scale for people who work very little (unemployed) they might well choose not to work, as it is not worthwhile. Secondly, there is a problem with complementary consumption. Normally, if your consumption benefits me, I can just give you money and be happy. With poverty it is the consumption of the group of people that affects me and everyone else. My contribution to the increase of their consumption is insignificant, so I choose not to contribute and free ride. If everyone else does that we have very little altruism. Lastly, it should be possible for people to insure themselves against poverty. However, people are mostly born into poor families, so they wouldn’t be able to finance the premiums. The solution to that is a comprehensive insurance with the same premiums for everyone. This system will have moral hazard problems and again creates high marginal tax rates. Poverty is bad first, because people do not like it and secondly, because of missing markets in insurance. There is actually too little consumption of goods that people desire. Furthermore, if one is below subsistence level one cannot work, so there are increasing returns to scale for some food, again giving rise to improvement. Finally, crime rates are highly correlated with poverty. However, in this survey household living standards are measured by incomes after housing costs such as mortgage interest or rents have been paid. One reason for the growth in inequality in recent years has been a rise in home-ownership amongst lower income households (mainly via council house sales) coupled with very high interest rates particularly at the start of the 1980s and the start of the 1990s. The real incomes of the poorest households on this basis are little higher than 1960s. Twenty five years ago those on the lowest incomes would typically have been living in local authority rented accommodation and would have had their housing costs met through a combination of central and local government subsidy. 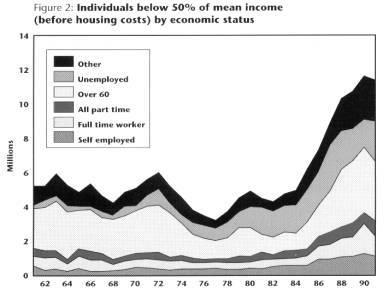 By the start of the 1990s many of the "new poor" were those who were trying to meet high mortgage interest repayments on the strength of relatively low earnings and with no entitlement to social security assistance. However, Wyeth and Burwood have rejected these measurements (The distribution of income in the United Kingdom 1961-96: an interim report, Economic affairs [London], Jun 1997, Vol.17, No.2, pp.39-42). They say it is correct to look at final disposable income. 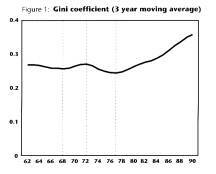 Current studies show an increase in inequality as measured by gross income Gini coefficient. They use the distribution of final income Gini coefficients to calculate the degree of inequality in standards of living. This clearly shows that the benefit system has served to reduce the inequality, a remarkable result from the conservative government. It is not surprising, however, when one looks at the increased welfare spending over the years. The original income is expected to show an increase in inequality because marginal tax rates were reduced dramatically, so no wage drift occurred. This shows that most of the poverty is due to pensioners, an obvoius fact because their incomes are indexed with price level and they automatically become poor as economy grows. However, there is also an increase of full-time employment poverty and decrease in unemployed poverty. This can be accounted by the tax system being more favourable for poor who work. Still it is clear that many workers will not be able to support themselves while working. This supports the introduction of minimum wage. However, then the trend might be reversed (Lucas critique). The most feasible tax reform one can imagine is to reduce marginal tax rates for the poor. Indeed, there are numerous evidence of ‘poverty trap’, which arises when people in work cannot improve their income by working longer hours or for higher pay, because working for more means they simultaneously pay more tax and receive less benefit. The Family Resources Survey suggests that at present about 100,000 working people face marginal deduction rates of more than 90 per cent. As the actual marginal tax rate for the poor is very low already (20% compared to 40% at the top end) there is not much that the tax reform can do. I will look at the benefits reform a bit later. Still, the present government is committed to introduce a 10% minimum tax rate. Its effectiveness as opposed to just political popularity remains to be seen. Turning away from actual figures and going into the theory of tax system, poverty is essentially eliminated by transfers from rich to poor. So one could make the poverty disappear by transferring enough. However, this would conflict with other aims of the public policy. It would be unfair and eliminate incentives. One can argue that starvation produces no incentives anyway. However, in this case we are talking about relative poverty, which can feasibly be a motivating factor for work. Anyway, from the theory point of view, the tax system should be least distorting for it to allow maximum feasible transfers. No distortion arises from common lump-sum taxes. However, these are impossible to implement, as people will not reveal their endowments. A Groves endowment revealing mechanism can be used, but this is usually wasteful. Diamond and Mirrlees have investigated the possibility of income taxes. These are preferable in asymmetric information cases, where workers know their ability better than the government. However, no clear conclusions as to which forms of taxation are optimal arise from the literature. The only policy recommendation seems to be to lower the top marginal tax rate in order to gain most revenue with least distortions (Mirrlees). One possible reform is a negative income tax. This means that the state is transferring money instead of social securities, giving individuals freedom to choose. However, no country has adopted this system because with a typical income distribution it would cost too much and raise the marginal tax rates to unacceptable levels. It seems that purely changing the tax reform will not help much and one must look at the social security as well. The aim on the social security is to distribute the tax revenues to provide relief for the poor. It must do so by least amount of distortion and as cheaply as possible. This essentially means targeting and means testing. As there are two main forms of social security in western countries – health care and education, it seems logical to give them free to poor. This is indeed what has happened. One could say that it costs more, on the other hand, rich are more willing to contribute when they know that poor receive something that rich think is good (education as opposed to cigarettes). There are a few things that government can do to the social security systems on the lines discussed above. The present government has decided to help move people from welfare to work, by focussing help on the unemployed and those detached from the labour market, and developing a framework of rights and responsibilities. It tries to “make work pay”, through a national minimum wage and a tax and benefit system that promotes work incentives. First, they have introduced a new tax credit paid to families on low incomes, directly through the wage packet. In principle, a working family tax credit has a number of attractions. It could reinforce the effect of the minimum wage. As a tax credit rather than a welfare benefit it should result in higher take up, while its clear link with the pay packet and the tax system should demonstrate the rewards of work over welfare. Secondly, government thinks that there is scope for bringing the national insurance structure more into line with income tax to ease administrative burdens on employers, to improve work incentives and to encourage the hiring of additional employees. They have reduced the employer’s contributions to make workers more employable. Finally there are number of attractive alternatives to reducing poverty without state intervention. It is common to exaggerate the effect of market failures. According to Coase’s theorem, as long as the property rights are well defined there will be no market failure. And although one cannot precisely know how private markets will enforce the property rights, they have done so remarkably well in the past. For example, they have overcome the free rider problem of charity contributions by assigning a particular poor family to each benefactor, so that their contributions are significant in a group. Many libertarians argue that the government in essence competes with private charities. As it has more resources, it is bound to win. Furthermore, by introducing legislature, it very often discriminates against poor (housing regulation is a prime example). So there is a case of reducing government involvement and letting private markets deal with poverty, as they did in the 19th century Victorian era. However, people are risk averse, and as they cannot predict the outcome of the private markets, they will tend to choose government intervention instead.